Cleans and removes stubborn oil and grease stains on concrete, stone, paving materials and uPVC window frames (not to be used on tarmac). Can be applied to brush, cloth or mop before use. Hazard safety codes: R22, R36, R37, R38, R41. Outdoor Oil and Grease Remover 4L is rated 3.0 out of 5 by 10. Rated 5 out of 5 by DavidC from Good product Suited my needs very well. 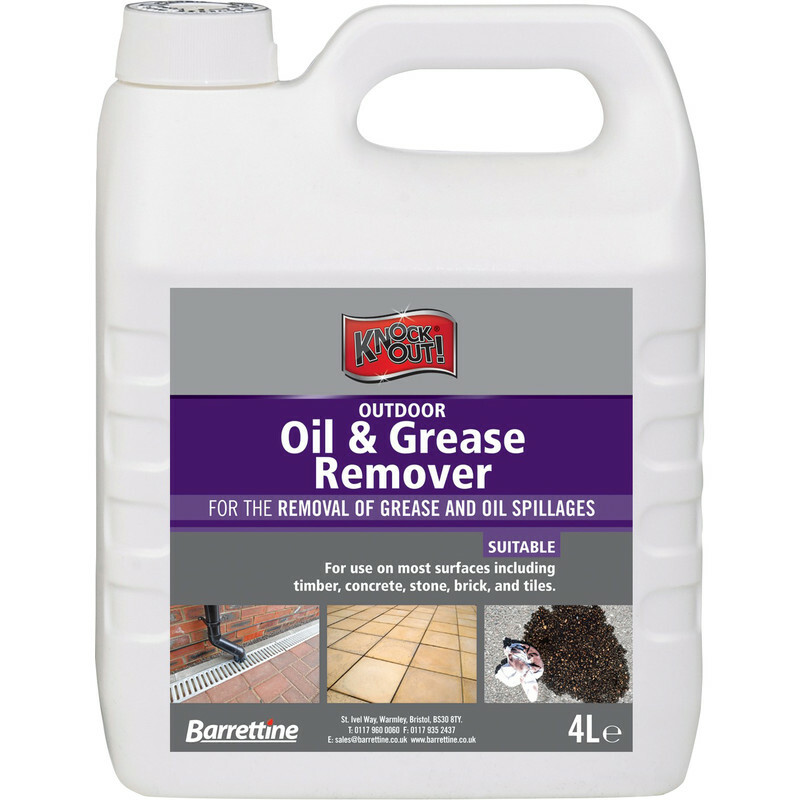 Rated 2 out of 5 by BeeNee from Bit weak with deep oil stains I bought this two weeks ago to remove a large oil stain from my garage forecourt tiles. It has not really worked; the stain is lighter but clearly still there! Rated 1 out of 5 by Hontreas from Useless Bought this to remove oil from mother in law's drive. For instructions as per the container but had no effect on the oil marks on the paviors . Rated 5 out of 5 by n4nlm from works a treat Worked perfectly on a couple of fresh oil patches from delivery vehicles on my painstakingly cleaned drive. 5 minutes only, very impressed so far. Rated 1 out of 5 by DiY Peterborough from Did nothing at all Followed the instructions to the letter but did not remove the oil patch at all from the paving. Would not buy again. Rated 5 out of 5 by moggieSR from Very effective! Using a plastic pump-up sprayer to spray a creosote substitute will damage all the 'O' ring seals of any sprayer. A double flushing out of the entire tank and sprayer with this Outdoor Oil and Grease Remover immediately after creosote spraying, was totally successful. - I dismantled the whole sprayer to check the effectiveness of the flush out, and there were absolutely no creosote traces around any 'O' ring seals or in the trigger mechanism. A powerful, easy to use, and wholly effective product.